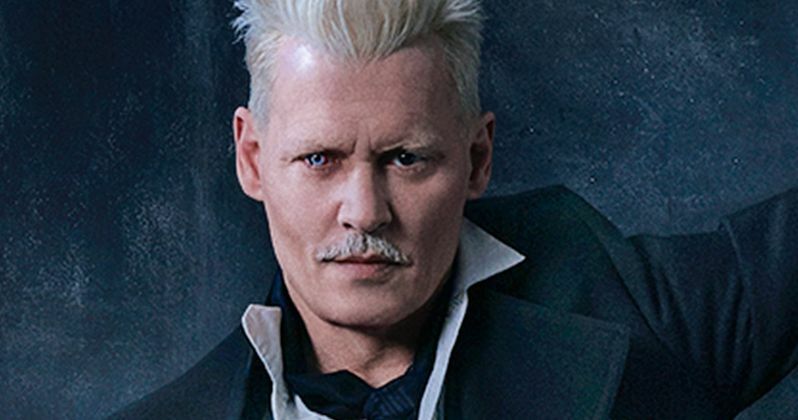 J.K. Rowling has broken her silence about the choice to cast Johnny Depp in Fantastic Beasts: The Crimes of Grindelwald and she is defending that choice. There had been questions and concerns over the casting after allegations of domestic abuse were filed against Depp, who also had a cameo as Grindelwald in Fantastic Beasts and Where to Find Them, by his ex-wife Amber Heard last year. Many fans spoke up of their disapproval and turned to the normally outspoken author for her thoughts on the situation to which she remained silent until now. J.K. Rowling wrote a lengthy statement and posted it to her personal website to address the decision to keep Johnny Depp on board during a time where any type of abuse towards women and men has come to the surface and become a hotbed of discussion. However, Rowling today described herself as "genuinely happy" to have 54-year old Depp on board. The author went on to explain the decision and largely said that it was a moment that happened between a couple in private and insinuated that it's really none of the public's business. Rowling explains. "When Johnny Depp was cast as Grindelwald, I thought he'd be wonderful in the role. However, around the time of filming his cameo in the first movie, stories had appeared in the press that deeply concerned me and everyone most closely involved in the franchise. Harry Potter fans had legitimate questions and concerns about our choice to continue with Johnny Depp in the role. As David Yates, long-time Potter director, has already said, we naturally considered the possibility of recasting. I understand why some have been confused and angry about why that didn't happen." At the time, Johnny Depp described the allegations as "salacious false stories, gossip, misinformation, and lies." And in January, he and Amber Heard released a statement, in which they tried to explain the nature of their relationship. They had this to say. "Our relationship was intensely passionate and at times volatile, but always bound by love. Neither party has made false accusations for financial gain. There was never any intent of physical or emotional harm." J.K. Rowling talked about what Depp and Heard shared in her own statement and it seems that was what ended up making the situation okay for all parties in the end. Rowling also talked about the hugely supportive Harry Potter fan base. She explains. "The huge, mutually supportive community that has grown up around Harry Potter is one of the greatest joys of my life. For me personally, the inability to speak openly to fans about this issue has been difficult, frustrating and at times painful. However, the agreements that have been put in place to protect the privacy of two people, both of whom have expressed a desire to get on with their lives, must be respected. Based on our understanding of the circumstances, the filmmakers and I are not only comfortable sticking with our original casting, but genuinely happy to have Johnny playing a major character in the movies." To conclude her statement, J.K. Rowling talked about her "joy" of writing the screenplays for Fantastic Beasts and Where to Find Them as well as Fantastic Beasts: The Crimes of Grindelwald. Rowling also said that she understands if people don't understand their position and that she's okay with it no matter what. The author goes to great lengths to say that "conscience is governed by committee." Rowling concluded by saying. While many fans disagree with the choice of casting Johnny Depp in Fantastic Beasts 2, many some completely fine with the decision and will trust the filmmakers along with J.K. Rowling for making the right choice. A lot of fans are looking at the situation as another way that Hollywood is protecting powerful men and see it has just a continuation. Warner Bros. has also made a statement in support of the decision, citing the joint statement released by Johnny Depp and Amber Heard. You can read all of the statement courtesy of J.K. Rowling's website.